The Spook's Apprentice may well be one of the books that has been sitting on my bookshelves for the longest and I could never really put my finger on why that was. But, since I was on a roll with some shorter books, I thought that I would give it a read. 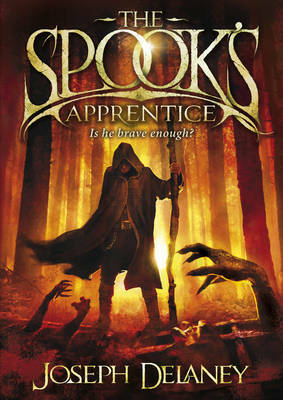 The Spook's Apprentice is narrated by Tom Ward, the seventh son of a seventh son, who has been apprenticed to a Spook due to his unusual circumstances of birth. As a seventh son of a seventh son, he can see things in the dark that other people can't. As a Spook, he would be responsible for protecting the people in his county from supernatural creatures like boggarts and witches. But he is less than certain about this particular path to take, as Spooks are often seen as a necessary evil, shunned by their community whenever they aren't being useful. And when he finds himself pitted against the powerful witch known as Mother Malkin, will he have the courage necessary to keep going? I am rarely so torn by a book. There is a part of me that does want to like this. Small villages terrorised by an increasing amount of the undead, a training regime involving consorting with the terrifying remnants left by tormented spirits, and lore that would appear to be quite extensive. But the pace goes by at such a clumsily fast rate that I get the distinct impression that the author doesn't actually want to talk about the world that he's built. There are several scenes throughout the narrative which could have been really effective and scary, if only the story took the time to build atmosphere and tension. So what they instead became was someone recounting a scary story that they'd been told as a speed run. It's an incredibly frustrating thing, because the narrative will make mention of something and then never build on it. For instance, the witches in this world can be divided into malignant, benign and neither (there's also a "doesn't know she's a witch" category, but come on people, we all know that that doesn't really count here). Not that you'd know it from the actual witches that turn up, who are all evil and eat babies. For no real discernable reason either. It's just something that these ones do. The only exception to this is a young witch named Alice, who isn't a witch yet, but will grow up to be one. Alice is related to the evil witches, but might as well be a stranger that they met in the pub for all the insight on them that she provides. I want to say that it feels lazy, but that word doesn't seem to fit; the background work is presumably there, the author just doesn't want to distract/interest his audience from the pedestrian plot. Additionally, I have a real issue with the character of the Spook himself. First of all, he seems to have some real issues with women and, like everything else of substance, it is ignored entirely. So occasionally he'll have moments where he just says, completely out of the blue, stuff akin to "Those lady creatures that make up half our population, you just can't trust 'em!" It's really distracting and uncomfortable, as the protagonist doesn't really make much comment about them. Secondly, his sense of what is barbaric is seriously screwed up. To kill a witch permanently, you need to either burn it or eat its heart raw. Both of those are horrifying fates, says the Spook, so instead I'll bury her alive and keep her prisoner in my garden like some horribly dangerous landscaping feature. Smooth.